Pokémon GO Tropius is a grass and flying type Pokémon, with 1846 Max CP and also known as the “Fruit Pokémon”. Tropius is region exclusive to Africa, South Spain and Crete. More info on: Gen 3 regional exclusive Pokémon. With ATK (136), DEF (165) and STA (198), Tropius is not a super exciting addition to the metagame, but we’re fine with that — Tropius is traditionally considered to be a weak Pokémon with limited use (in the core games). Although Tropius doesn’t have stellar stats, we expect him to have some usage. With its unusual typing, Tropius can take on both water and grass opponents, given an appropriate moveset. Takes double super effective damage from Ice type attacks. Takes regular super effective damage from Fire, Rock, Flying, and Poison. Since immunities are not in the game it should be neutral to Ground type moves instead of being immune to them. Razor Leaf beats out Air Slash in the slightest way possible. Although Air Slash has a power of 14 and Razor Leaf only has a power of 13, Razor Leaf hits slightly faster and has a higher DPS. Both fast moves receive STAB, but usually a dual typed move set is better, as it allows the Pokemon to do better against certain opponents. Leaf Blade, however, knocks the other two charge moves out of the park. With a base power of 70, it already out damages Stomp and Aerial Ace which both have a power of 55. Stomp only has two bars, while Aerial Ace and Leaf Blade both have three, so overall, Leaf Blade is the best choice because it will hit more frequently and with more power than the other moves. 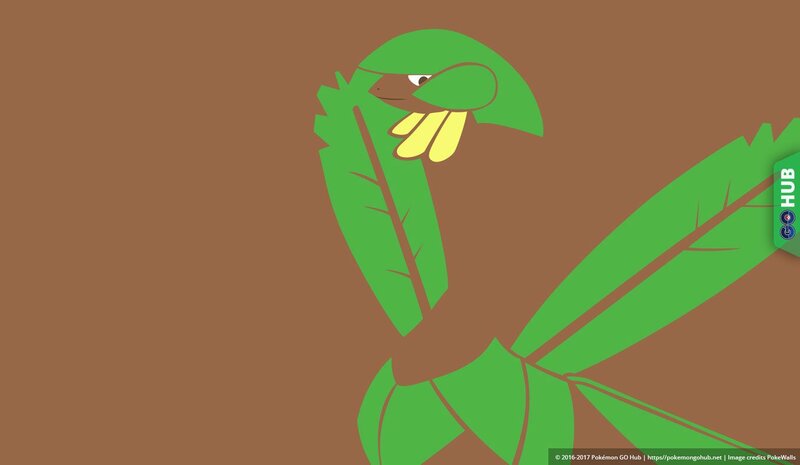 A normal Tropius has a brown body, and is wrapped in green leaves on its chest and head. It also has massive, broad, green leaves on its back. It has a yellow, banana-like fruit growing on its chin. A shiny Tropius has a gold colored body, and is wrapped in bright leaves on its chest and head. It also has massive, broad, bright yellow leaves on its back. Tropius made a major appearance on the 401st episode of the Pokémon series (Advanced Generation: Episode 127) titled, “From Brags to Riches”. This article is a preview of an upcoming feature. Info listed here is subject to change.